Technical Education – Sanction of additional 500 seats to Rajiv Gandhi University of Knowledge Technologies(RGUKT), Basar Campus for the Academic Year, 2018-19 – Orders - Issued. In the references read above, the Vice-Chancellor(I/C), Rajiv Gandhi University of Knowledge Technologies, Basar Campus, has stated that the admissions for the 6-year Integrated B.Tech Programme are done on the basis of CGPA secured in the tenth class by the applicants, duly following the Rule of Reservation. Initially, the intake of students was 2000 for the years 2008 and 2009 at each constituent campuses of RGUKT. In the year 2010, the intake was reduced to 1000 @ each campus, due at lack of infrastructure facilities and students' accommodation at the campus. The intake is kept at the same level for the Academic Years, 2011-12 to 2017-2018 i.e. for the past seven years inspite of the vast development of the campus. The University has developed modern laboratory facilities and well equipped class rooms for teaching and sufficient accommodation to meet the additional intake. The University will be able to admit 500 students more than the actual admission provided requisite budgetary support is given by the Government. The additional expenditure in this regard will be about Rs.9.28 Crores per Annum. 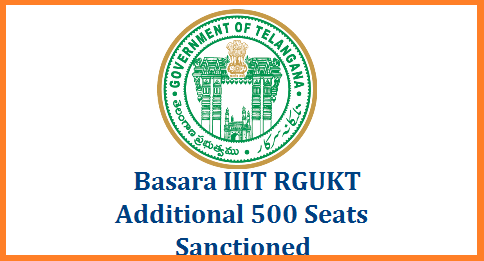 The Vice-Chancellor(I/C), Rajiv Gandhi University of Knowledge Technologies, Basar Campus has requested the Government to sanction additional 500 seats for the Academic Year, 2018-19 to admit the meritorious students into RGUKT.